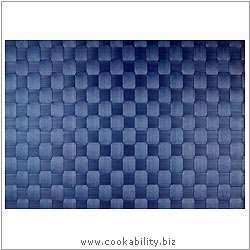 Saleen Woven Tablemat Blue Grey 22mm weave. Our fabric place mats are available in range of different colours. The woven fabric is made from polypropylene yet offers natural texture. The weave is 22mm. Heat resistant to 70°C. The fabric is waterproof and dishwasher safe.